221 Georgia Street East is closed over the summer for extensive renovations. Please join us for SWARM Festival of Artist Run Culture on the evening of September 8, 2017 for our reopening. 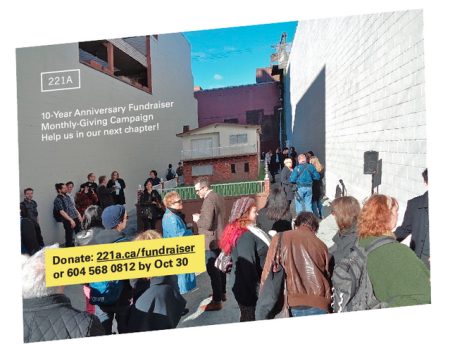 The Annual General Meeting (AGM) for 221A Artist Run Centre Society will be held on Saturday, September 17, 2016 at 2:00pm at 221A (100-221 E Georgia St in Vancouver). Member registration and renewals will take place from 1:30–1:55pm. The AGM provides members with an opportunity to gather and hear reports on the past year of activities. The AGM is also an opportunity for members to meet incoming and outgoing board members, take part in voting for the Board of Directors and for important business of the society such as the appointment of the auditor. Please be notified that the society will be considering a special borrowing resolution, viewable here. It’s already been 10 years since we started. Help us in our next chapter as we support the production of new contemporary art, achieving meaningful public dialogue on design and its social effect. We are not interested in living forever, but we are curious about our future possibilities. 221A is pleased to host Geraldine Dening at Urgent Imagination: Part II, a two-day conference developed by Western Front that will take place on October 2 and 3, 2015. 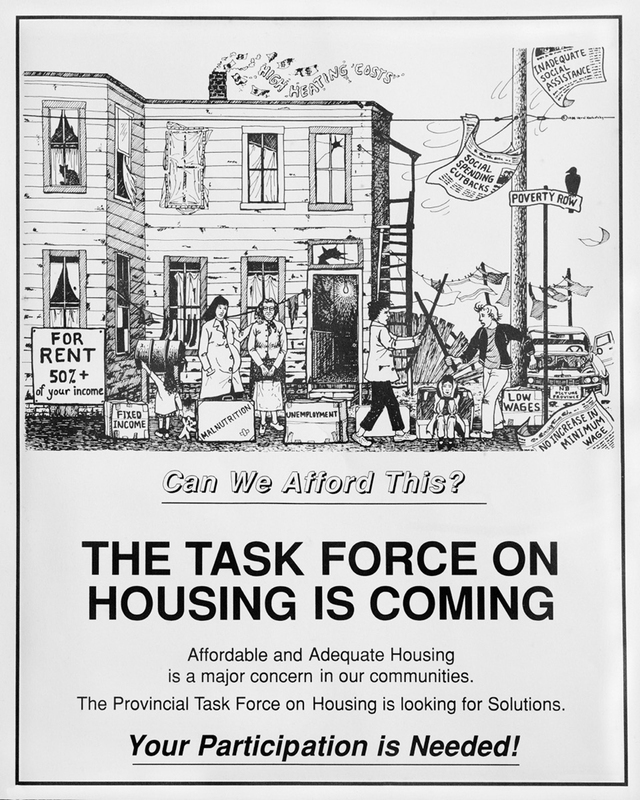 The event proposes alternatives to Vancouver’s current mode of developer-driven architecture and urban planning. Dening is a London-based architect, a senior lecturer at De Montfort University, and a founding member of Architects for Social Housing (ASH); a collective of urban designers, academics, engineers, artists, and activists who are responding to London’s present housing crisis. As part of its mandate to find sustainable alternatives to the planned demolition of Greater London’s social housing, ASH works with and offers support to the residents of the region’s estimated 3500 housing estates, who face eviction and displacement in the wake of up-market regeneration schemes.